Thomas & Betts Carlon® 1-Piece Non-metallic 90-degree liquid-tight fitting in gray color, has PVC construction for added durability. It has 14.22 mm long thread. This corrosion-resistant fitting with 3/4-Inch trade size, has dimension of 0.56-Inch x 1.73-Inch x 2.25-Inch x 1.63-Inch x 1.44-Inch. It offers plug-in connection without the need of compression nut. 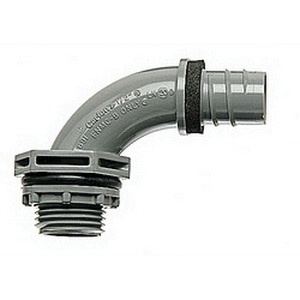 Non-metallic fitting is UL listed and CSA certified.